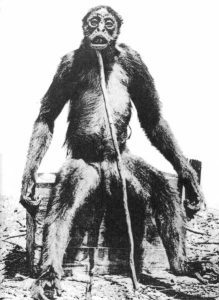 Cryptids are a part of cryptozoology, which is the study of animals who are believed to exist by many but have yet to be proven. There are dozens of cryptids out there, and many cryptids have now been found, and proven to exist. Although many cryptids could just be legends, or may have already gone extinct it’s always possible that there are some really out there. While Searching for petroleum in a rain forest, between Colombia and Venezuala, Francois De Loys made an amazing discovery. His expedition was disastrous from the beginning. They had trouble dealing with disease and attacks from the natives, the team of 20 they started with was quickly whittled down to a team of four. While camping near the Terra river they were surely feeling down, when two extraordinary creatures appeared. Two creatures walked towards them, De Loys thought they were bears at first because of their enourmous size. He quickly noted there monkey like features and realised they couldn’t be bears. The giant primates were aggressive and began fling faeces at the team. They shot one creature, and let the other one run away. He then propped the body up with a stick and took a picture that became very famous. This giant sea monster has plagued the waters of Ayia Napa for years. 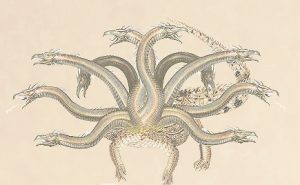 It’s said to have the monstrous form of a giant women in torso, it’s lower body is that of a serpent, and has six snarling dog heads attached to it. The creature is very famous in Ayia Napa, with many locals claiming to have seen it. The best evidence for this creature is the countless amount of people who claimed to have seen it. It attracts a large amount of tourists oping to see the beast, although most people are disappointed. It’s said that anything who encounters it is killed instantly. The Dohbar-Chu is a famous creature of Irish folklore. It means water hound in English. It’s described as a giant dog, wih the features of an otter. It lives in the water but has fur to protect itself. It’s been spotted numerous times in Ireland. The most recent sighting was from an Irish artist Sean Corcoran, who saw it on Omey Island. He described it as a large dark creature which made a haunting sound. One of the most famous stories about the Dohbar-Chu comes from the 17th century. It says that a man once heard his wife scream while she was doing the laundry. He ran to help her but she was already dead with a Dobhar-Chu standing over her body. In a fir of rage the man stabbed the creature in the heart. The creature screamed and it’s mate came out of the water to take revenge. After a long battle the man finally killed the second Dohabr-Chu as well. Bigfoot is famous in countries all over the world, and is mostly spotted in pacific Northwest. 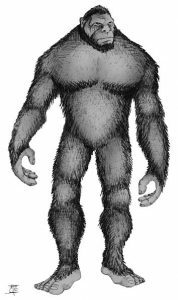 Sightings of a big foot like creature have been around hundreds of years, since before there was even a name for bigfoot. A lot of people spend their time searching for bigfoot, even though there is little evidence, and most of the scientific community believe it isn’t real. 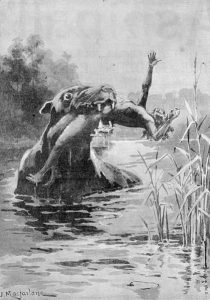 the bunyip is a giant mythical creature said to inhabit swamps, billabongs, and riverbeds. It’s a part of aboriginal mythology and folklore. 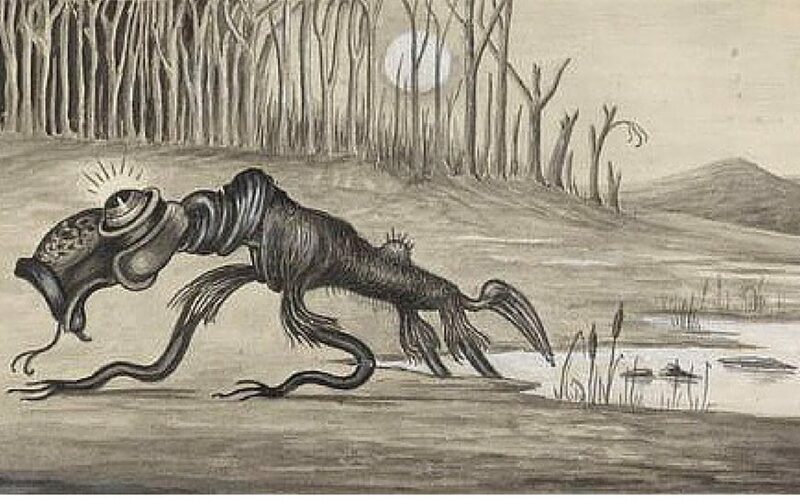 It’s hard to know what the bunyip looks like as most accounts of it seem to describe different things. It generally seems to be large and black, it is sometimes describes as a black, monster dog, but it has also been described as a large squid creature. Dated back as far as 29,000 years ago, the giant rhinoceros is said to be 15ft tall, and 16 ft long. Unlike normal rhinoceros it has very long legs, meaning it can gallop quickly like a horse which is extraordinary for it’s size. It’s size is close to the woolly mammoth. It weighs 3 to 4.5 tonnes. The size of the horn is unknown, but considering it’s general size, it’s likely to be quite big. Due to size, spear, and deadly horn, if it were to charge into a human you would be completely destroyed. 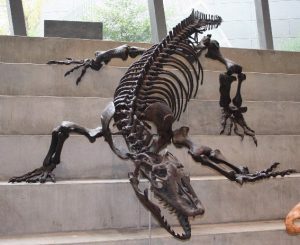 Also known as Megalania, are a type of lizard that went extinct around 50,000 years ago. Although they disappeared so long ago, it’s possible that the first Aboriginals of Australia might of encountered. It was the biggest known lizard to have ever existed. And judging from it’s size would have preyed on medium to large sized animals. It had a large skull, and deadly serrated teeth. It also might have been one of the largest poisonous animals there was. They were enourmous, some growing to 23 ft long, and weighing over a thousand pounds. Also known as the great snake of the orange river. Grootslang is a creature said to be as old as the world itself. When the gods were new to crafting animals, they made a mistake making this one, and accidentally made it too cunning, and powerful. The gods them divided it into two creatures, elephants and snakes. One Grootslang managed to escape, and then carried the species on, they are now to said to live in caves full of diamonds and gems. Qilins are a part of Chinese mythology and said to appear when a sage or great ruler dies. Even though they appear when someone dies, they are actually a good omen, and are said to predict prosperity. 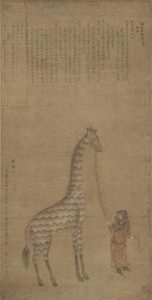 The Giraffe is seen as a symbol of the Qilin because a Chinese admiral called Zheng He. Zheng He travelled to Africa in search of treasure, and came back with many exotic animals including a giraffe. When the emperor saw the giraffe he announced it was a Qilin and said that it was a sign of his greatness. The abominable snowman is a bear like creature, that towers over men in height, and is said to inhabit the Himalayas. The people indigenous to the region mostly believe in the abominable snowman, or yeti. Many people from that area claim to have seen one, if not many. The Yeti is famous all over the world and has often made appearances in popular culture. They Yeti is in the form a humanoid polar bear, who has enourmous strength, and size.